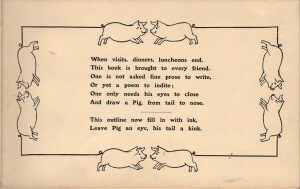 Upon first glance it seems that people in 1908 have no idea how to draw, let alone produce a successful image of a pig. And then you look more closely at the poem at the beginning of the book and it becomes clear. They are drawing these pigs blindfolded. 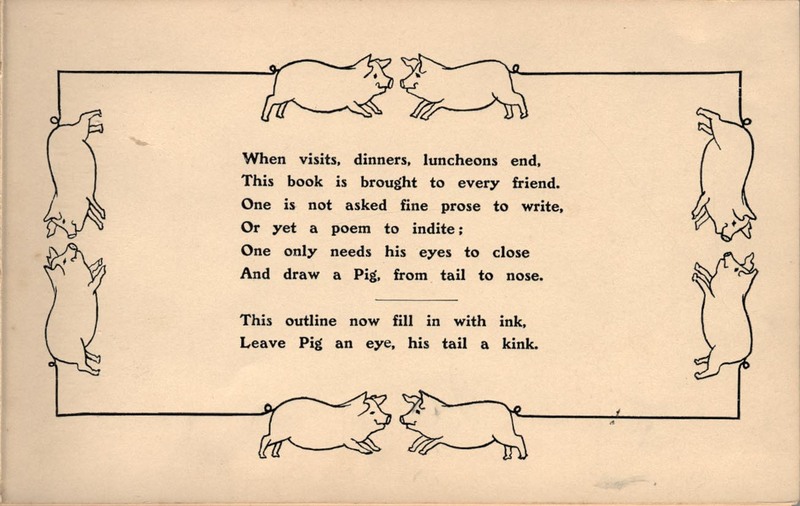 This volume, Guest Book : Many Pigs of Many Pens, was published in 1902 as a playful alternative to a traditional guest book. 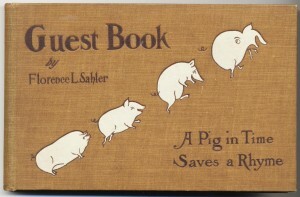 In conventional guest books, visitors were expected to sign their name and contribute a poem, sketch, quote, or witticism. 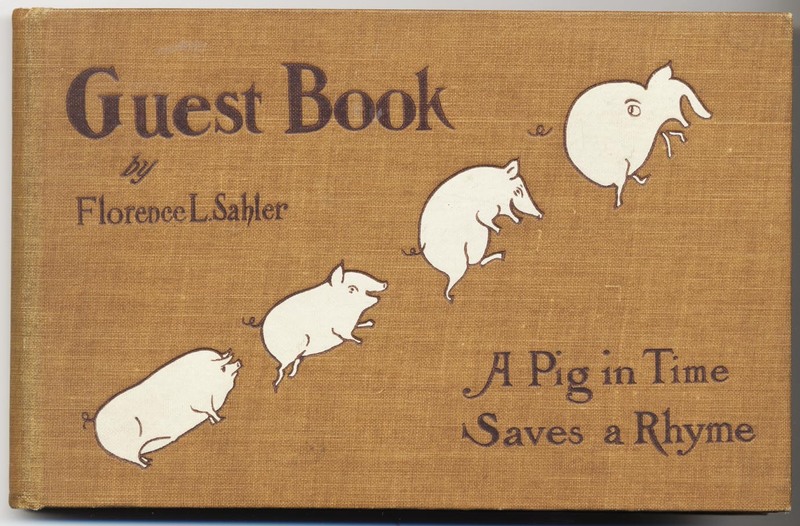 The purpose of this guest book explains the statement on the cover – “A Pig in Time Saves a Rhyme.” This copy was given as a present to John Nicholas Brown II (1900-1979) in 1908. 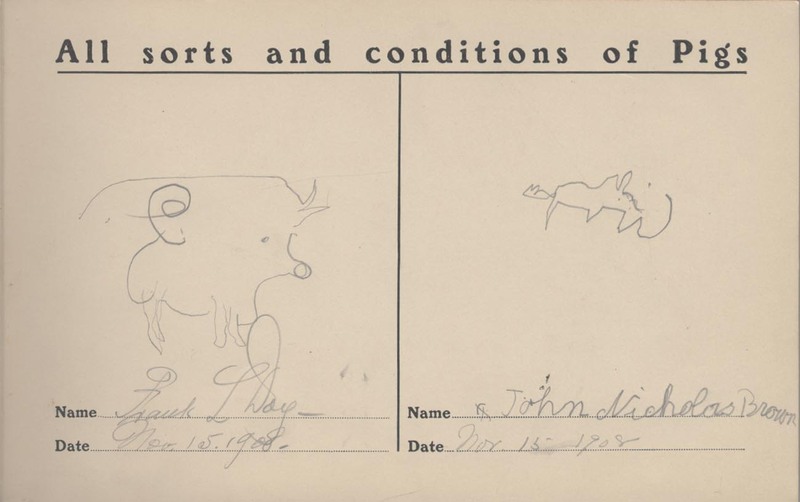 The first image above shows the eight-year-old’s attempt at a pig. 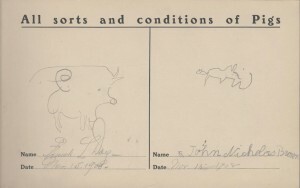 It is one of many items in the Natalie Bayard Brown papers (Ms.2007.011) at the John Hay Library. Mrs. Natalie Bayard Dresser Brown was the wife of John Nicholas Brown (1861-1900) and the mother of John Nicholas Brown II (1900-1979). Her papers reflect her active involvement in the many Brown family businesses, the Democratic Party during the 1930s, and numerous charitable causes through correspondence with family and friends, writings and speeches, scrapbooks, and photographs. The elder John Nicholas died of typhoid fever 2 months after the birth of his son followed soon after by the death of his brother Harold Brown. Those tragic events made John Nicholas Brown II the heir to the Brown family fortune and he was dubbed the “richest baby in America.” The John Nicholas Brown II papers (Ms.2007.012) contain a wealth of material on the visual arts, art collections and collecting activities, and public service at the state, national and international levels, as well as the history of Brown University and the State of Rhode Island during the twentieth century. Both of those collections, and many others related to the Brown family, can be viewed at the John Hay Library. This entry was posted on November 15, 2012 at 3:00 pm	and is filed under Collections, General Interest, Uncategorized. You can follow any responses to this entry through the RSS 2.0 feed. Both comments and pings are currently closed. Brown University Blogs | Theme: Andreas09 by Andreas Viklund.